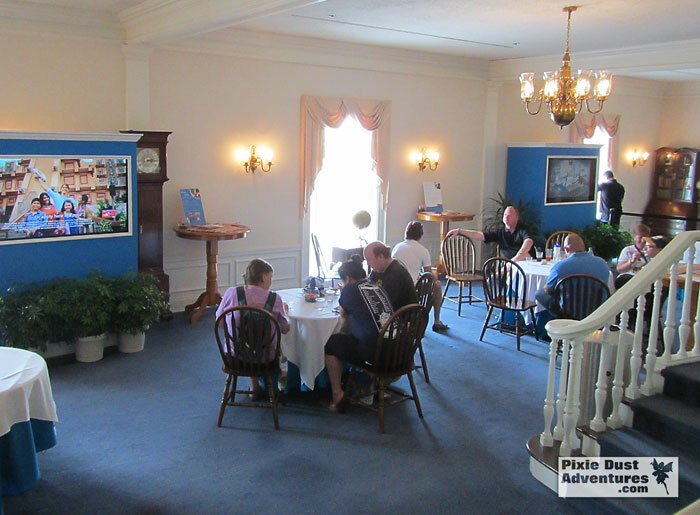 The Chase Visa Lounge is located in the American Adventure Pavilion on the third floor; to gain access, use the elevator or stairs located between the attraction and the gift shop. 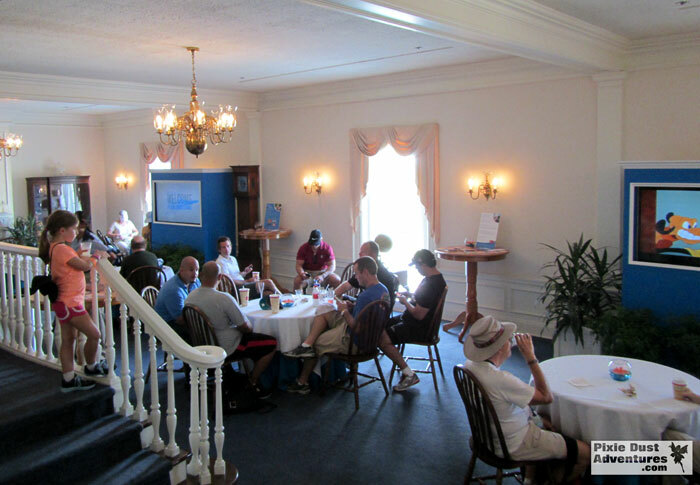 Lets take a look at some of the best reasons to visit the Chase Visa Lounge in Epcot! 2. 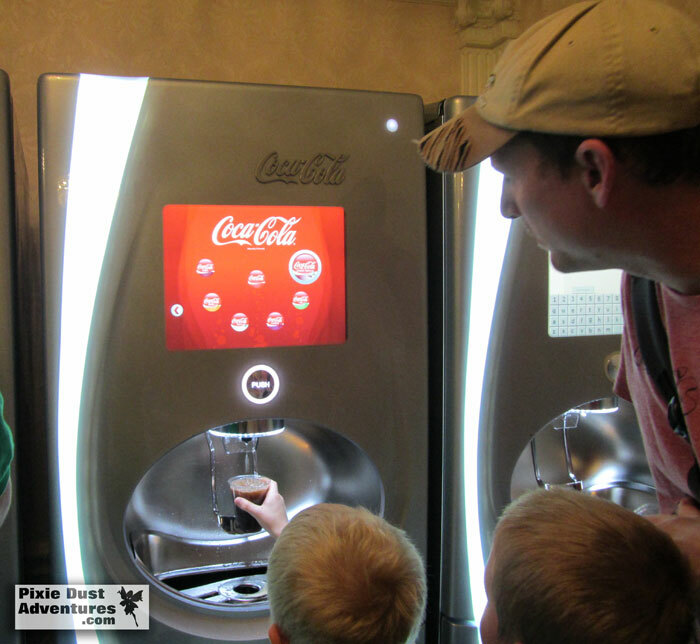 Refresh and Quench Your Thirst – While visiting the Chase Visa Lounge you can use one of several Coke Freestyle machines to slake your thirst. They provide the cups and you can visit the machines as many times as you like. If you have never used a Coca-Cola Freestyle Machine before, you really should try it. The flavor possibilities are endless. 3. Video Games and Cartoons for the Kids – One thing that made it easier for us to enjoy our time at the Case Visa Lounge was the entertainment that was available for the kids. 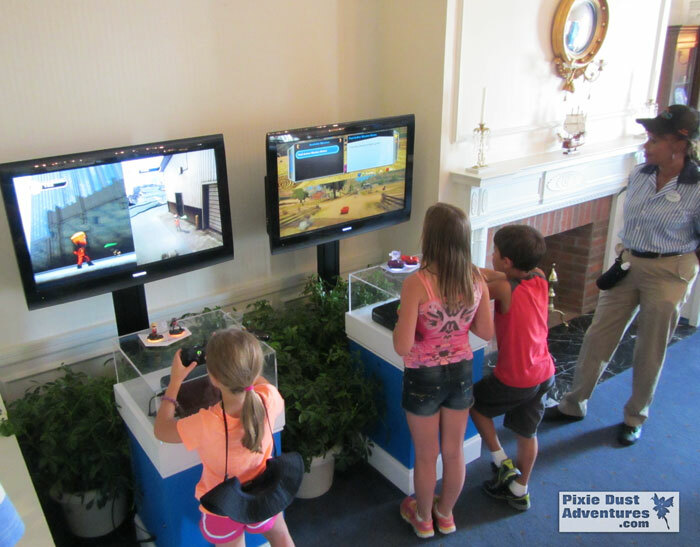 They had a large television showing Disney cartoons as well as two video game stations where the kids could enjoy time playing the new Disney Infinity game. Disney Infinity set up on the X-Box for kids to enjoy playing while parents relax. 4. Special Illuminations Seating Area – This lounge is where you can acquire a wrist band that allows you into an exclusive Illuminations viewing area that is available only to Disney Visa cardholders. They only hand out a certain number of these wrist bands so be sure to visit the lounge early in the day before they are gone. The table set up in the Food and Wine Festival to hand out wrist bands for reserved Illuminations seating and other special privileges. 5. Other Special Surprises – Along with the wrist band that allows entrance into the Illuminations viewing area, they will often offer special surprises. When we were there in October 2014, they offered cardmembers a special caricature drawing of themselves. In order to get these, hand drawn, caricatures you had to arrive early in the morning & were handed a wrist band and given a time to return and meet the artist for your session. Even though we did not have a band to get a drawing of ourselves, we found it relaxing to watch the artists work on drawings of other people. 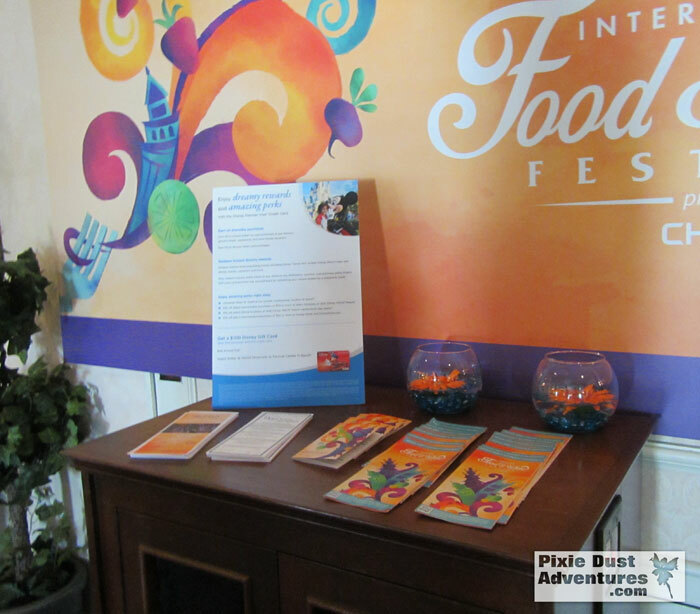 Food and Wine Festival maps and passport books. 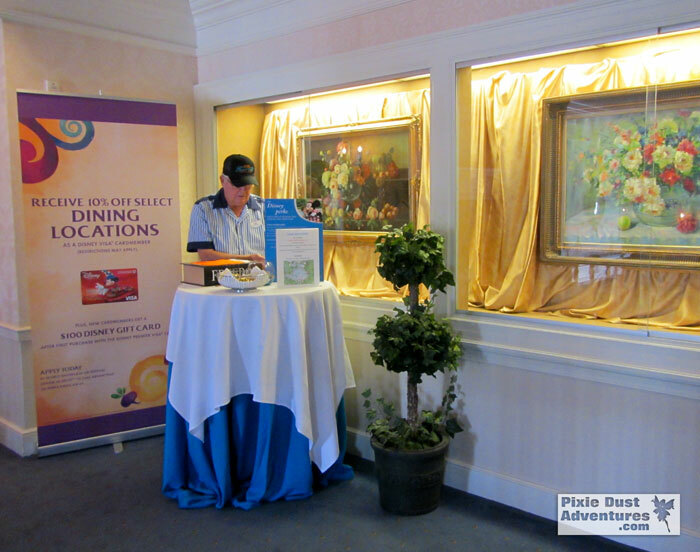 If you are a Disney Visa Cardmember, be sure that you don’t pass up this exclusive lounge the next time you visit the Food and Wine Festival. Operating hours are from 11am – 9pm on Sunday through Thursday and 11am – 10pm on select Friday and Saturdays. My name is Melissa and the Food and Wine Festival is one of my favorite times to visit Epcot. My family enjoys tasting the food from around the world all in one place. It’s like a culture day at school, with immersion by sight, smell and language. If you would like to take a trip to Epcot’s Food and Wine Festival, contact me for a free quote. I can help you book and plan your next Disney vacation at no additional cost above booking directly through Disney and you will get all of my planning assistance from personal experience. ← New Disney Infinity Content announced for the Disney Cruise Line Bands. This is good to know! I just got a Disney Chase and look forward to reaping these benefits! I knew about the first few but not the last two! 5. Other Special Surprises – Along with the wrist band that allows entrance into the Illuminations viewing area, they will often offer special surprises. When we were there in October 2015, they offered cardmembers a special caricature drawing of themselves. In order to get these, hand drawn, caricatures you had to arrive early in the morning & were handed a wrist band and given a time to return and meet the artist for your session. Even though we did not have a band to get a drawing of ourselves, we found it relaxing to watch the artists work on drawings of other people. Today is September 21, 2015…is this something that is anticipated to be offered, or a typo? ?